So For the last few weeks, I have been watching craigslist like a hawk. And I scored big time. An independent (not a junk yard or specific jeep parter) in Denver was parting a 95 sahara. I bought just about the whole interior from him for $400. The jeep was a hard top, and was wrecked 5 years ago and has just been sitting… The interior is almost perfect. there is a single rip in the drivers seat bolster that is about 3/4″ long, little to no fading at all. LOVE hard tops for this reason. 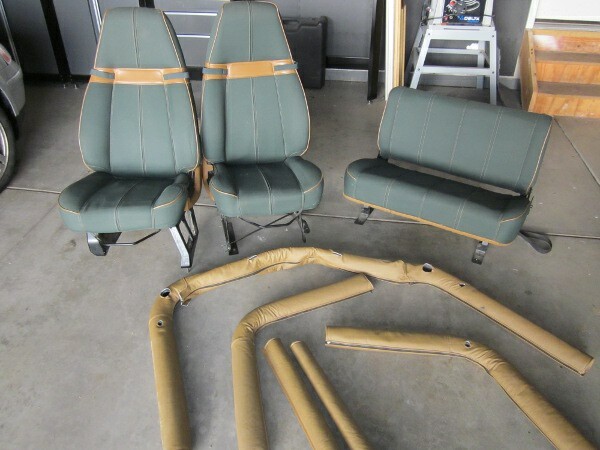 The differences between a 92-94 Sahara and 95 Sahara Interior are the following: The correct carpet color is green (mine is green already, check), the 95 has spice carpet. The center console 92-94 is green, 95 is spice. The Dash 92-94 is gray, 95 is spice. The interior door panels are spice in a 95, 92-94 has green, and the pockets on the half doors are all spice vs spice and green trim. The rest is the same. I got his seats, all 4 seat belts, roll bar padding, and carpet. He threw in the carpet, when I tried to haggle his price, so I figure I can resell it to recoup some of what I spent, since my carpet is good, and this one was the wrong color. I needed all this, as you’ve seen the condition of my seats.. ICK! The drivers seat belt has a cut in it 1/2 way through, I had picked up a junk yard replacement, but it was very faded and looked bad. And the roll bar padding was filthy and wasn’t coming clean, and had some burns/repair marks in it. My plan, is to not install these items until I paint the jeep, since I will be taking everything out when I paint, I might as well only do all the removal once/replacement once, instead of multiple times. Once that’s done I’ll sell the extra belts, and seats (if I can considering the shape they are in) to recoup at least some of this cost. Oh and those extra brackets and seat sliders can be sold too. I’m soo excited about how nice these seats are! And you can tell how nice the roll bar padding is as well. Old Ratty Chewed on pockets - New(to me) Nice ones!